booming. The aftermath of the 1960s, the Carter/Reagan years, were an era of bad faith and bad feeling, of low cultural energy, of pessimism on the disintegrating left. In this climate, you would expect the magazine’s arts section to fight the power by becoming the agitprop master of ceremonies for our unpopular front. That did not strike me as a very inviting road to take. But I might have had to take it were it not for The Nation’s long tradition of allowing its Books and the Arts section an independence almost unique in journalism—and I think I can say that with some authority, having been around the block in magazineland since then. In its 150-year history, the arts section has occasionally been to the left of the front of the magazine, more often to its right and sometimes, as in my tenure, deliberately all over the place. It speaks to the decency of a publication often accused of hewing to a hard line that it allows this freedom. And in my case, it speaks also to Victor Navasky’s editorship, which was not so much “wily”—Calvin Trillin’s word—as liberal. But before we get to those years, I should explain that there was a “trickle-down” effect of editorial independence—to use the annoying Reaganite term of that era. What I was given in terms of freedom I bestowed in turn on critics and reviewers, knowing that I was bound to disagree with them from time to time. That was not the hard part. The hard part, the sometimes regrettable part, came in those instances when a writer tested our commitment to the First Amendment with opinions bound to wound our friends, fellow editors and the magazine’s supporters. I think I can be forgiven for being unwilling to recount any of those instances here. They were remarkably painful, and the slim satisfaction of sticking to principle did not seem worth it. One afternoon, as I was readying for publication a particularly severe review of a book by a writer who was also a friend, the phone rang. It was Chris Calhoun, our advertising director. “You sound like you’re in hell sitting on a bench next to Roy Cohn,” he said. It could be like that sometimes. But occasionally, as with Mary Summers’s review detailing Jesse Jackson’s political and personal shortcomings—which appeared just before the magazine endorsed him in the Democratic presidential primary—our discomfort seemed to me a small price to pay for a healthy shot of candor. Summers’s article created a difficult moment in the office, but we survived it, and in my view the magazine was the better for that. As the 1970s turned into the 1980s, I was increasingly convinced that The Nation’s arts section should play a role in the mainstream cultural conversation, that it should take on the rising tide of cant in the land. Of course, we continued to cover significant titles from small presses; kept our eye on books about civil rights, nuclear disarmament, Latin America and elsewhere; reviewed significant fiction; and knew what the poets of Ghana were up to—but independence gave us the latitude to have some fun at the expense of the latest thing in books, films, theater. (In all of this, I was helped by a series of assistant literary editors who were, I can say without false modesty, more able than I: Gordon Graham Dowling, Amy Wilentz, Elena Brunet, Maria Margaronis, Julie Abraham.) Why, I wondered at the time, should a big, pulpy bestseller not be fodder for The Nation’s pages? When Doubleday published Hanta Yo, marketed as the Native American version of Alex Haley’s Roots, the anthropologist Raymond DeMallie’s review, “Ayn Rand Meets Hiawatha” [April 28, 1979], disclosed the book’s bogus ethnography and the political agenda of its author, Ruth Beebe Hill. And he did so in a stylish, scholarly article that was much talked about, is still a pleasure to read, and continues to be cited to set the record straight on the Plains Indians and the dreadful (and dreadfully popular) Hanta Yo. Once you start causing this kind of trouble, more of it comes your way—a good thing, I thought at the time. 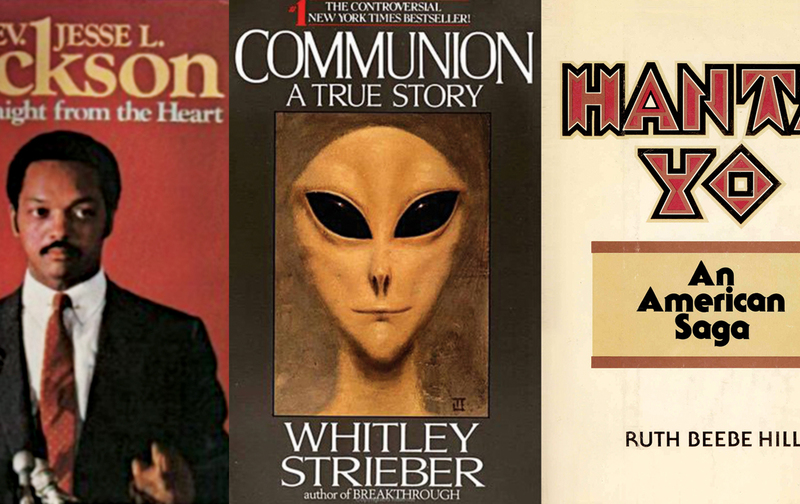 Tom Disch’s hilarious, nearly 6,000-word review of Whitley Strieber’s “nonfiction” account of his abduction by aliens, Communion [March 14, 1987], was an outlandish tour de force in which Tom describes being abducted by extraterrestrials who force him to wear a Mr. Peanut costume as he tries to interview Strieber. It was a brilliant piece that did nothing to prevent Communion from hitting No. 1 on the New York Times bestseller list. Even so, it is still out there as a definitive account of the kind of hoax that money, cynicism and the publishing business will concoct. When Tom died in 2008, I remember seeing the piece mentioned as the best book review ever written. It just might be. If the cultural climate of those years was, as I’ve said, mostly room temperature, it isn’t surprising that its antidote at The Nation were high jinks like Tom’s, as well as a fair number of polemics. Like a great piece of satire (for example, Calvin Trillin’s “Dinner at the de la Rentas’,” which took aim at a drooling New York Times Magazine cover story describing the fashion designer and his wife as if they were latter-day Medicis [January 17, 1981]), a good polemic outlasts its specific occasion even as it delivers a kick to the passing scene. Most of the memorable ones of those years arrived unbidden. (By which I mean I did not necessarily see them coming, a certain unpredictability being part of their charm in a magazine of necessarily predictable political opinion.) But I knew what I was getting into when Barbara Grizzuti Harrison wanted to take on Joan Didion… or I thought I did. I have long been reluctant to reread that 7,000-word annihilation of Didion’s every sentence, suspecting that I would wince at this high-spirited killing. But I have finally done so, and I think it is grand. It is an outraged and outrageous piece, wonderfully wrong occasionally and much more wonderfully right, hilarious at times, sanctimonious at others, a passionate, big-hearted and very smart moral calling to account of a writer pretty much indistinguishable from the heroine of Play It as It Lays, a “fragile madonna of acedia and anomie.” Take a look. Yes, Harrison’s political views did happen to line up with the magazine’s—but allowing her all those words when we could have reviewed the book on Albanian trade unions that Victor had retrieved from the discard pile? You had to appreciate the freedom. I still do. Oh, and the article sometimes comes up all these years later when the subject of Joan Didion does. I do not want to give the impression that Victor did little more than tolerate an irreverent arts section. I know that he admired Arthur Danto’s art reviews, that he was proud to publish (as we all still are) Stuart Klawans’s film criticism, that he liked having a critic such as Tom Disch write about theater. The “arts” were as strong as the “books” in the section; its critics were independent—of me, of received opinion, of everything save the rogue territory they each staked out and that the mainstream had to reckon with. mann as Alger Hiss. I was loitering in Andy Kopkind’s office that morning while he was under his desk, fooling with the plug for his Smith Corona. Victor entered with some excitement: “Betsy, Andy, Alger is here!” Andy looked up: “And not a moment too soon, Victor. I’m having trouble with my typewriter.” Did Victor smile? He did not, and I am certain he would not have a few hours into the screening had he seen Andy’s version of the Pumpkin Papers in the form of a tiny, thrice-folded note handed to me: “Guilty as charged. I’m going to lunch.” If we want to account for the irreverence of Books and the Arts in those years, we might look closer to home than the malaise of the Carter/Reagan era, and instead at the mischief engendered by the weird mix of Victor Navasky’s political correctness and his enjoyment in the wayward behavior of others. It made much possible.